I hope you like my legumes recipes because there’s more coming. Great for your 4 Day Diet and beyond. I got this recipe from Vicky at tastefull.gr and changed only to make it a little drier. How to make: Rinse the lentils and boil them for about half an hour or until the lentils are soft but not overcooked. You can add couple of bay leaves in the water while boiling. 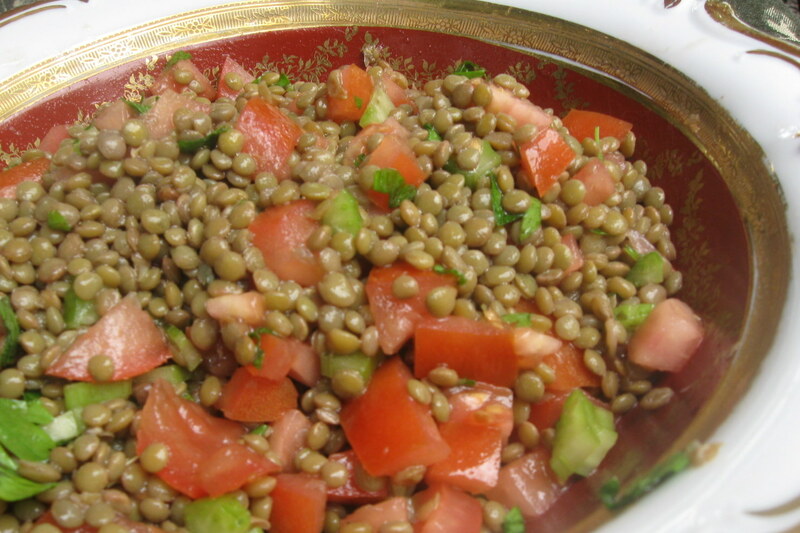 Drain the lentils, add salt & pepper and combine them with the tomatoes, celery, and lots of parsley. Add olive oil, vinegar and, optionally, soy sauce, to your taste. Your dish is ready. Notes and tips: Add the salt and pepper while the lentils are still hot but the tomatoes, celery and parsley after they have cooled. Today I this salad with regular wine vinegar because I’m on a diet and want to avoid the sugar you get from balsamic vinegar. I also left out the soy sauce but added a whole lot of parsley. Lunch for word ready!